Designers are hired to make people’s mouths drop open. We push for those moments when people just stop and stare, because something within the design speaks to them. This type of reaction goes beyond good design and strong narrative voice. 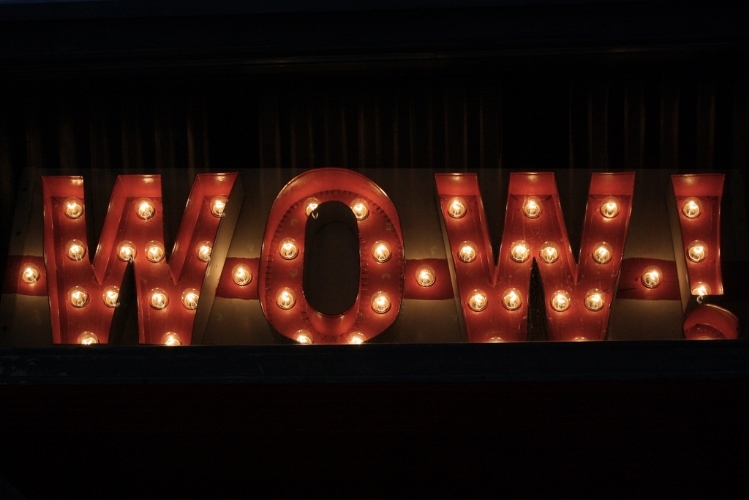 Both of those are compelling and recognizable, but they don’t necessarily create what we like to call the WOW Factor. You know what we’re talking about. It happens when you’re browsing through websites online, or flipping through a magazine, or walking down a store aisle. You’re minding your own business, only vaguely impressed by the things you’re seeing, and then—WHAM. The WOW Factor hits you, and you can’t look away. And in a world soaked through with advertisements, creating the WOW Factor is a priceless skill for designers. It could be the skill that gets you the job. But first, you understand how to find the WOW Factor, and second, you need to know how to leverage the WOW Factor for the best results. Let’s clear one thing up first: The WOW Factor is not necessarily loudness or how much a design can push its way into focus. A quiet design can be just as breathtaking as a highly stylized design. It all depends on the audience. Because the truth is, the WOW Factor is fluid. It’s not the same thing from one design to the next, or one audience to the next. That’s why it’s so hard to quantify, and why clients can usually tell you they want it without knowing exactly what it is. So how do you figure out how to generate the WOW Factor? Here’s the one thing all WOW designs have in common: They fully realize the concepts behind them. As you probably know, conceptualizing is a huge part of creating a design that works. You can’t just slap a good design together with some good words—one needs to complement the other, and they both need to build toward a grander idea. So, consider your audience. What concepts speak to them? Apple users, for example, were captured by the idea of innovation and simplicity, and Apple used these two ideals to help build their brand image. What speaks to your target audience? Simplicity? Sophistication? Quirk and cleverness? Ground your concept in that. Then tie your design into it. Add a voice that resonates with your audience and—WOW. Achieving the WOW Factor is a great accomplishment. But if you don’t leverage it correctly, the design could make a splash without actually making a lasting impact. Advertisements exist to create results within the marketplace. Your ad needs impact and demonstrated success. So you've got to go a step deeper by tying the WOW Factor to one or more of your client’s value propositions—the things that makes them distinctly different from other similar companies. Apple has succeeded because it speaks to customers who think differently and want something different, something innovative. By tying sleek, contemporary design (WOW Factor) to a spirit of innovation (value proposition), Apple recognizes big wins time and time again. Other companies employ a similar paradigm, and you can, too. So learn what speaks to your audience and add just enough twist to your concepts to surprise and delight them. Do that, and you'll be WOWing with the best of them in no time.